The children are the most evident, emboldened by the numbers in their forever rotating, mottled and mixed-aged groups. They wander the perimeter of the dirt field, the building, the apartment. Sticks in hand, plastic ill-fitting and ill-suited sandals forever slipping off. They watch for an adult who may give them an instruction or who may not. They search. They attempt play. Boys skittle rocks imagining them to be marbles. Girls jump plastic tape fashioned into elastics. Laughter is infrequent. Their attention span is short. Games abandoned at the sight of a slowing car, an adult who may have looked their way. 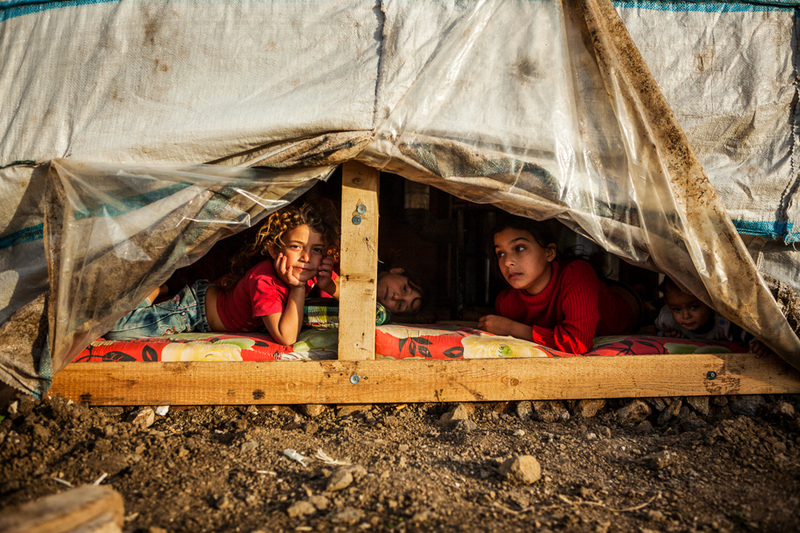 These are displaced Syrian children on any one of the days in the past five years in no-name and easily forgotten towns, run-down city neighbourhoods, or plastic informal tented camps across Lebanon. 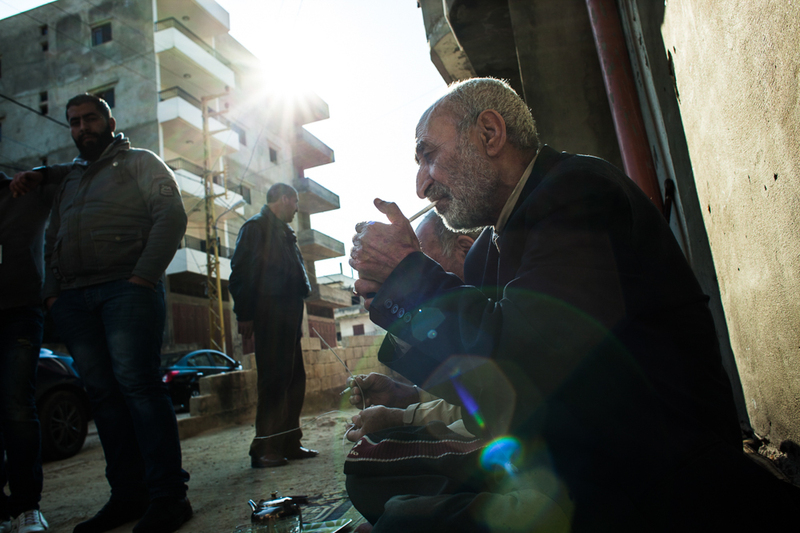 Over 1.1 million refugees from Syria have now sought refuge from conflict in their homeland into Lebanon. They are daily attempting a life in a foreign land that is often struggling with its own domestic issues, resource and unemployment constraints, with depleted savings and nothing but the clothes they fled Syria in. As the weeks fall into months, and months pass into years, Syrias displaced people in Lebanon, equipped with an innate drive to survive, push on with a life where a future persists in the uncertain. Confinement, fear, and a relenting desire to return to their homeland where they feel their identity as Syrians can only be true, a hallmark for most. With over one in four of its 4.5 million population a refugee, Lebanon has the highest per capita refugee rate in the world, according to United Nations Refugee Agency. 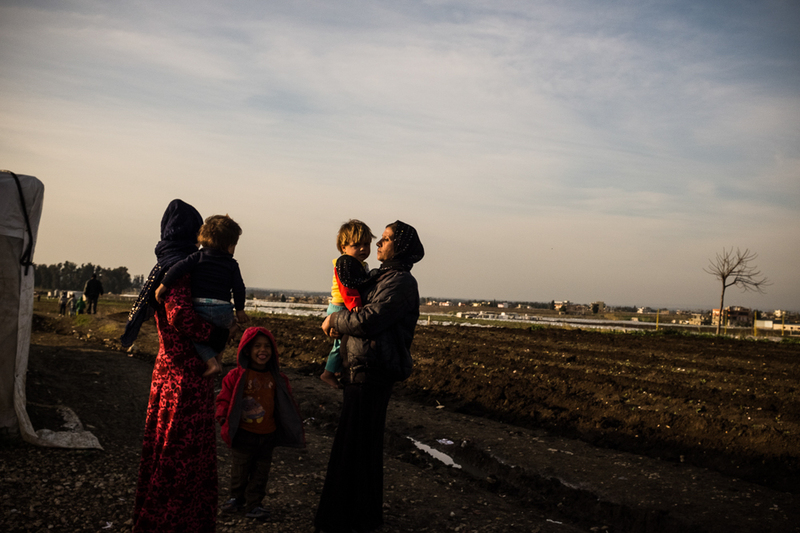 Over 1.2 million are Syrians escaping conflict, of which 825,000 are women and children. 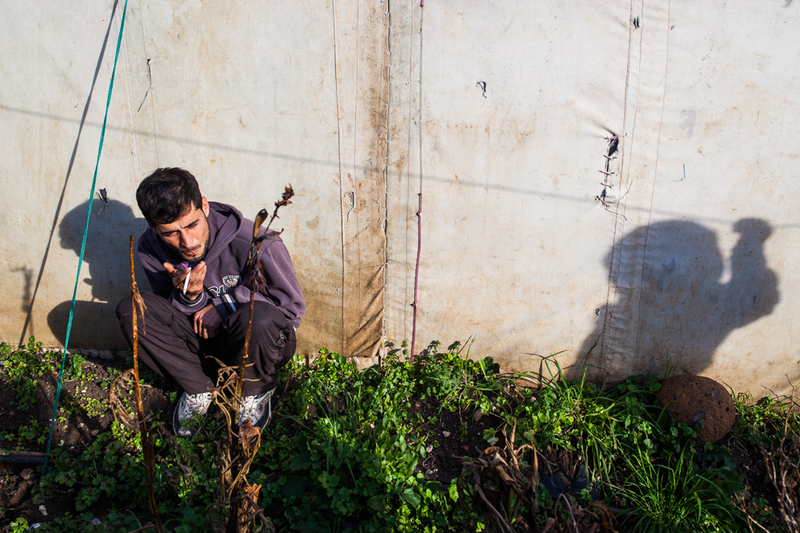 Confinement, born from fear and immobility, has increasingly become the mainstay for many Syrian refugee children. Informal Tented Settlement, Helba, Tripoli, Lebanon. 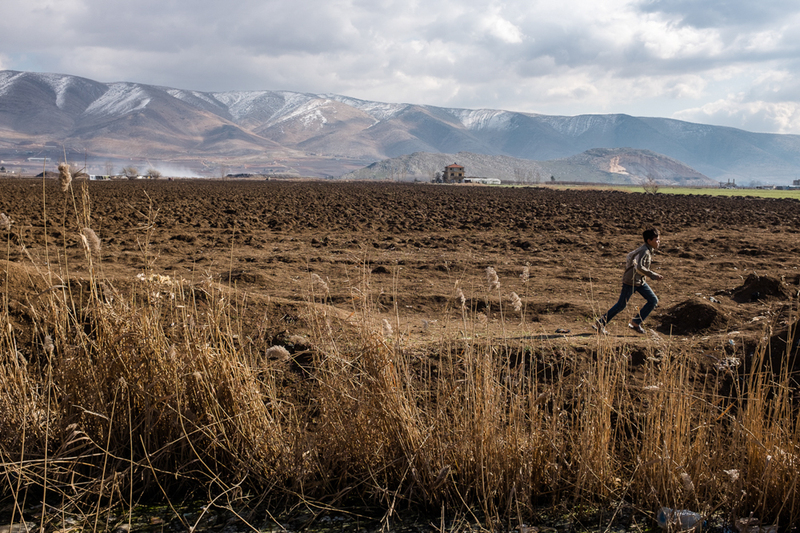 A lone child runs freely across a field that connects the impoverished lean-to informal camp of Bar Elias in the Bekaa Valley he must live in, with the Syrian border that sits behind him in the mountain range shouldering the field. Struggling to deal with influx of some 10,000 refugee every week, the Lebanese government all but closed its borders to Syrians in October 2014, aside from extreme humanitarian cases. 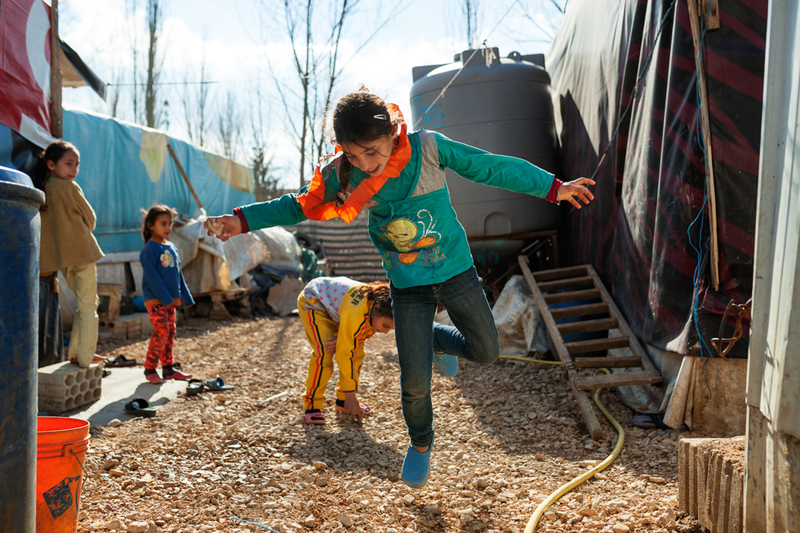 Hiba and her three younger sisters play next to their tented home in Bar Elias Informal Camp, Bekaa Valley, Lebanon where they have lived for the last three years. 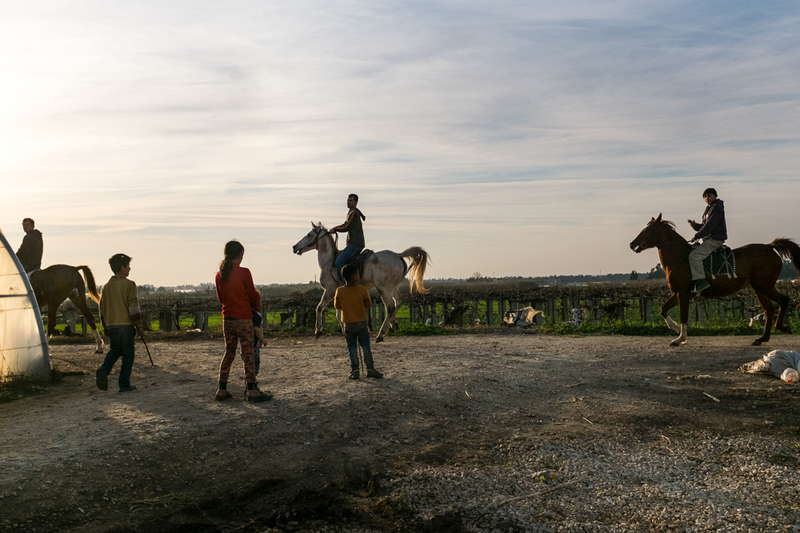 With guardians of children fearful of letting children out of their sight, many Syrian children the Danish Refugee Council meet in the field are living isolated and confined lives, a far cry from the extended socialising connected to Syrian culture. With the Lebanese government opposing the construction of formal refugee camps in Lebanon, for the thousands of Syrian families who have long depleted their savings and are unable to pay rent, many must make do with what they can find to shelter under. According to UNHCR over 40 per cent of refugees from Syria live in insecure and exposed places such as garages, unfinished buildings, and informal camps across Lebanon. 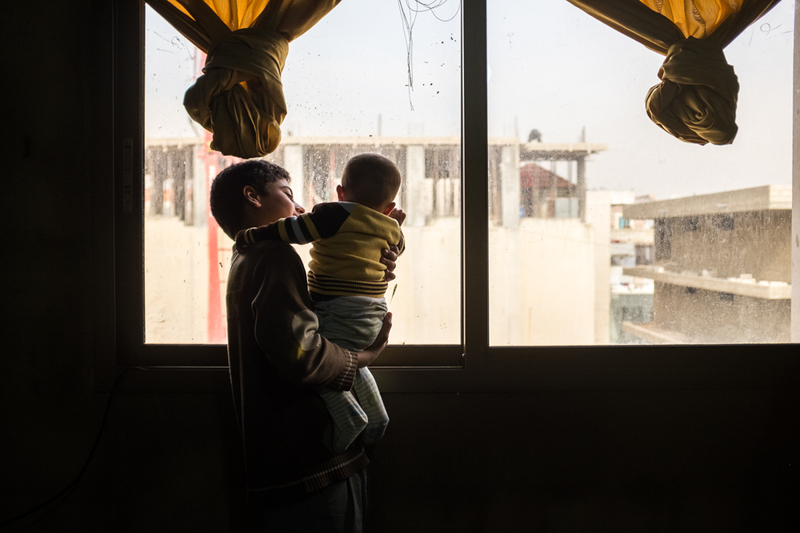 Abdullah holds his younger brother in an apartment he lives in with his nine family members that is funded by the Danish Refugee Council in the Bekkaa Valley, Lebanon. 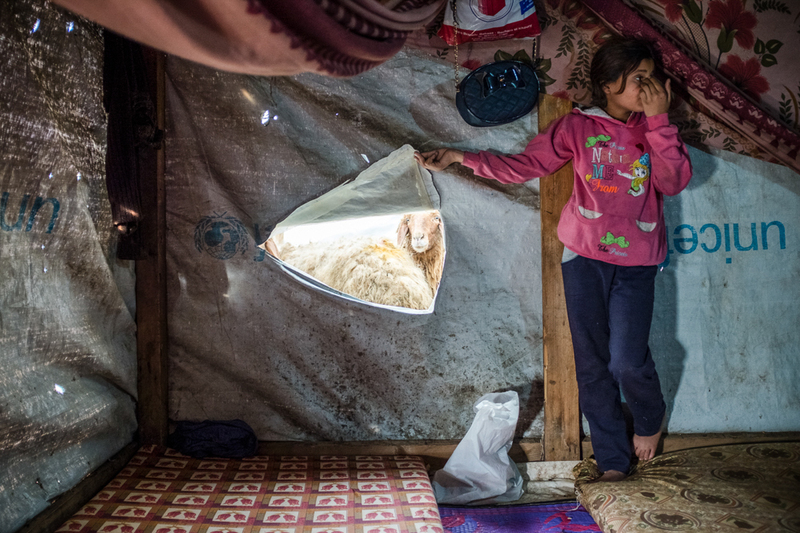 With the inability to legally work, and for many savings long gone, 70% of Syrian refugees in Lebanon are now living below the Lebanese poverty line of $3.84 per person per day according to the UNHCR. In 2015, the DRC refurnished 59 multi-story buildingsCollection Centersacross heavily populated refugee areas of the Bekaa Valley and Tripoli, providing rent-free homes for some 960 of the most vulnerable refugee families. 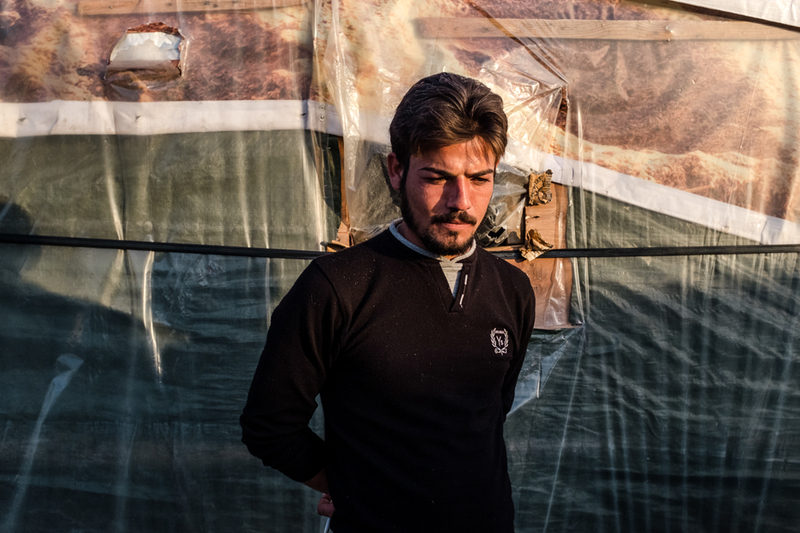 A young Syrian male attempts to find solace amongst the over-crowded tents in an informal settlement in Helba, Tripoli. 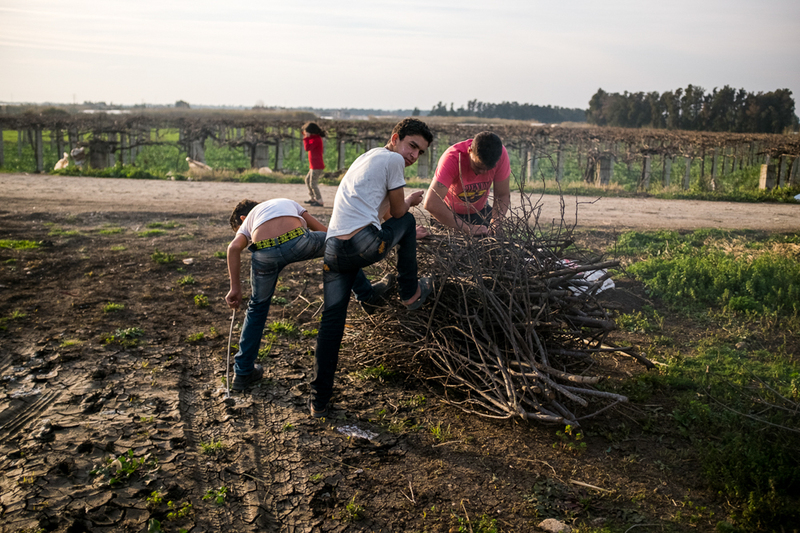 According to the International Labor Organisation, only around half of refugees from Syria are economically active and just one third have access to overwhelmingly informal and low-skilled employment, leaving many, in particular young men, feeling increasingly helpless. 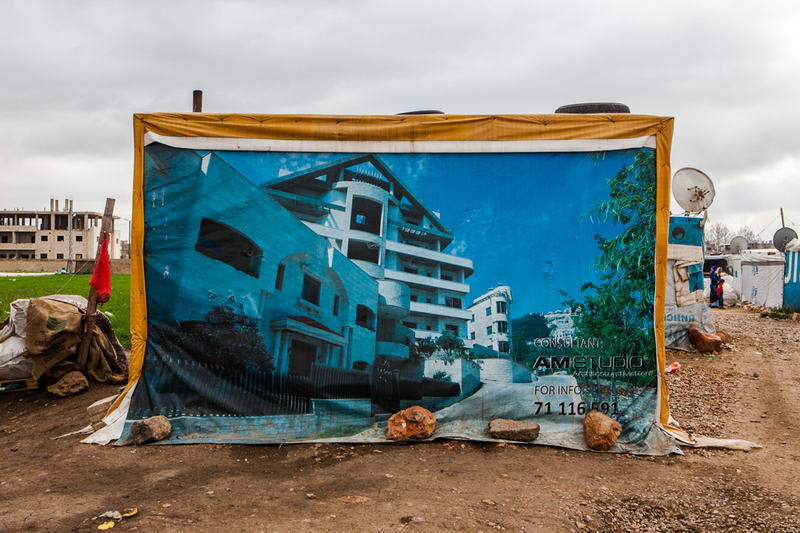 With plastic sheeting for housing in demand, Lebanons glitzy advertisements pushing a life of luxury have become an incongruent mark in many informal refugee camp settlements. A space of their own. 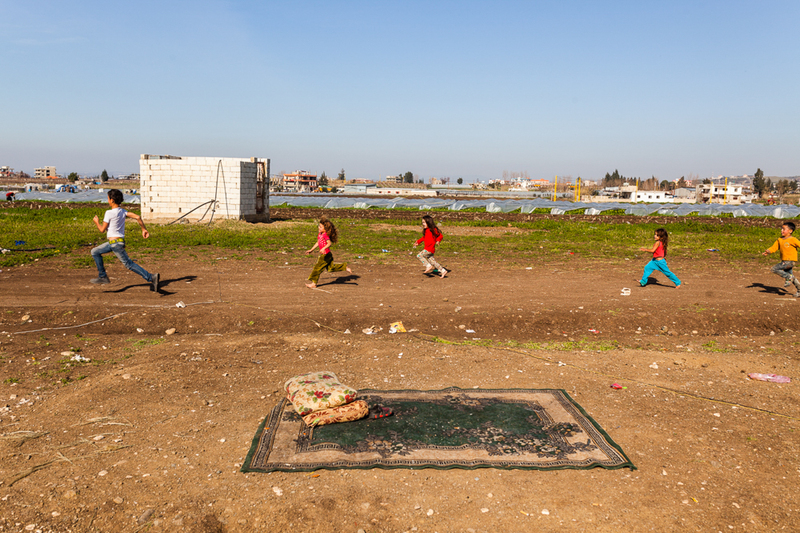 With gripping poverty now confronting over half of the Syrian refugee population in Lebanon, play for Syrian children is, often without toys, reduced to imagination and invention. As refugees from Syria push to find spaces for refuge in Lebanon, informal tent settlements have sprung up across the country. 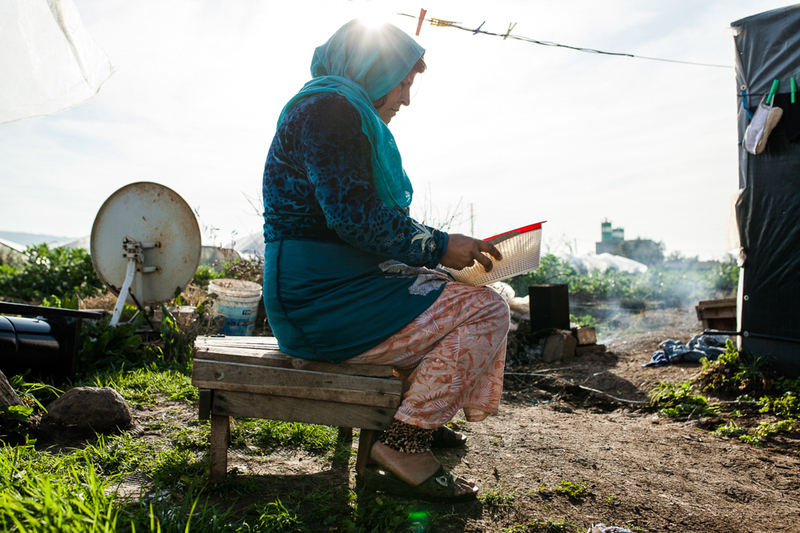 This settlement in Akkar, North Lebanon, is home to eight families. Another day waiting. In January 2015, the Lebanese government introduced additional visa regulations for refugees to attain their residency permit, costing USD$200 per person, and must be renewed annually. The impact of this expense has meant a typical family of six individuals now struggles to bear the cost of their residency. Many refugees, and in particular men, unable to afford the permit are increasingly remaining hidden in shelters or informal settlements for fear of being caught without legal documentation. The new permit regulations created additional obstacles for refugees mobility and travel within the country, impeding travel for medical and educational purposes, or livelihood opportunities for fear of being stopped and detained at Lebanese check-points. A girl looks down the stairs at a collective centre in Tripoli. 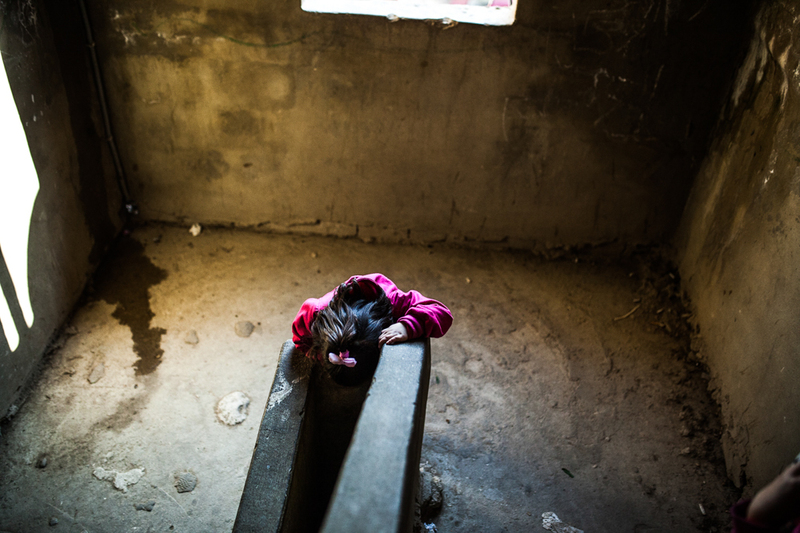 Mercy Corps report around 68 percent of Syrian refugee children and adolescents are out of school in Lebanon, and many have not seen the inside of a classroom in more than three years. 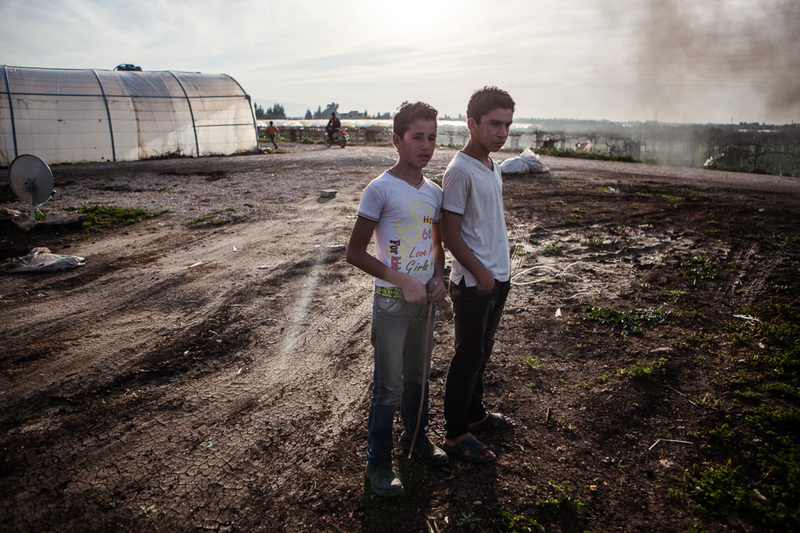 Teenagers among the smoke in an informal settlement, located between crops and green houses, in northern Tripoli. Preparing dinner. According to the World Food Program assessment almost 30 per cent of refugees from Syria living in Lebanon faced food shortages. 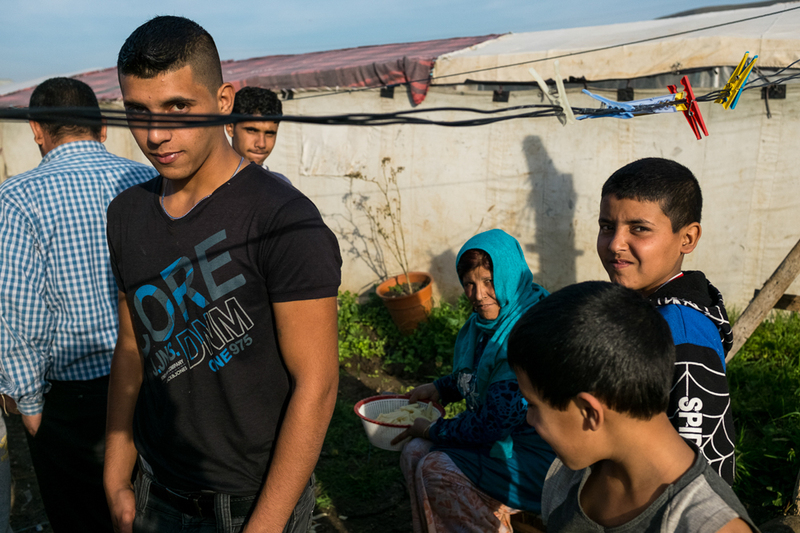 Over 70 per cent of refugees from Syria living in Lebanon have moved at least twice within the country, increasingly to shared accommodation with other families or informal settlements as savings run out and they search for affordable housing. 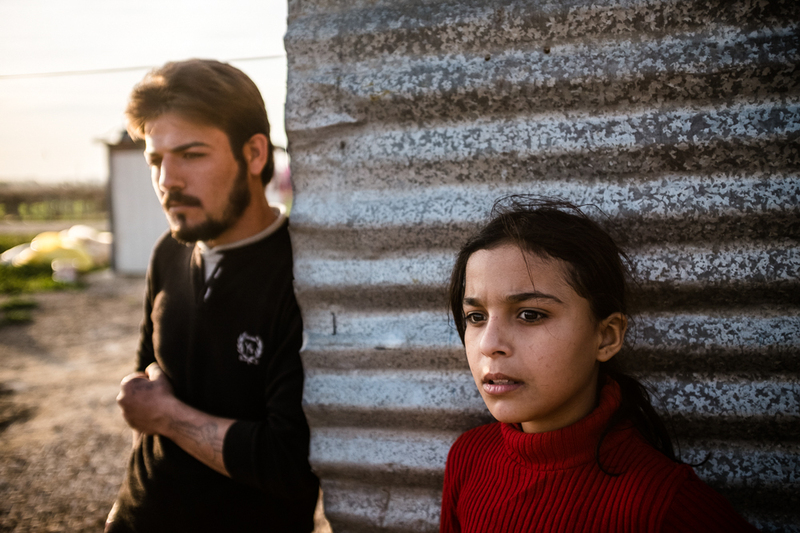 A brother and sister from Idlib in the Informal Settlement in Helba. The majority of the 40 families living there are from Idlib, Syria, where they lived a life dependent on agriculture to sustain themselves. Informal Tented Settlement, Helba, North Lebanon. According to UNHCR, some 81 percent of Syrian refugees in Lebanon rent their accommodation, paying an average rent of $200 for what is often little more than a plot of land. 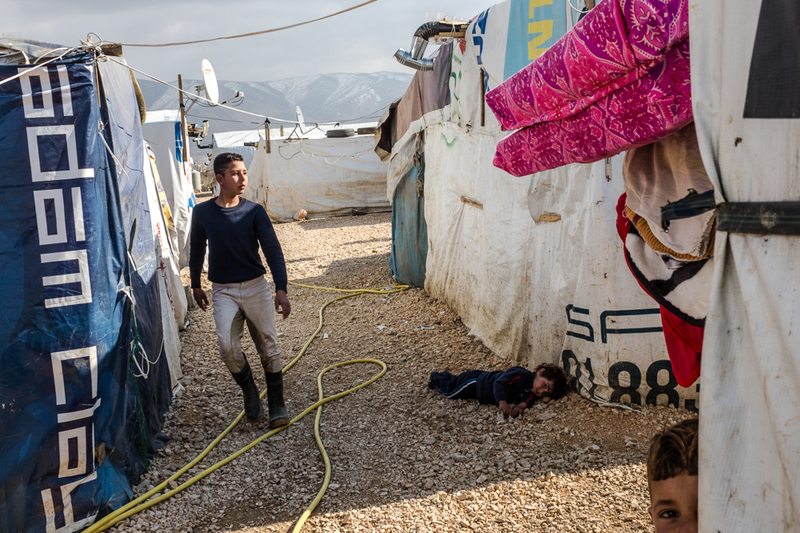 Over 40 per cent of refugees from Syria in Lebanon live in insecure and exposed places such as garages, unfinished buildings, and informal camps. 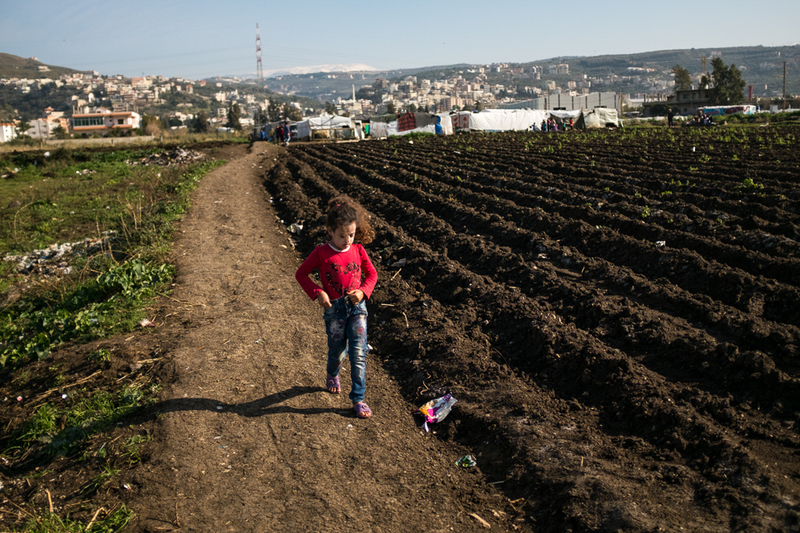 A young girl walks to her familys tent across a freshly ploughed vegetable field. 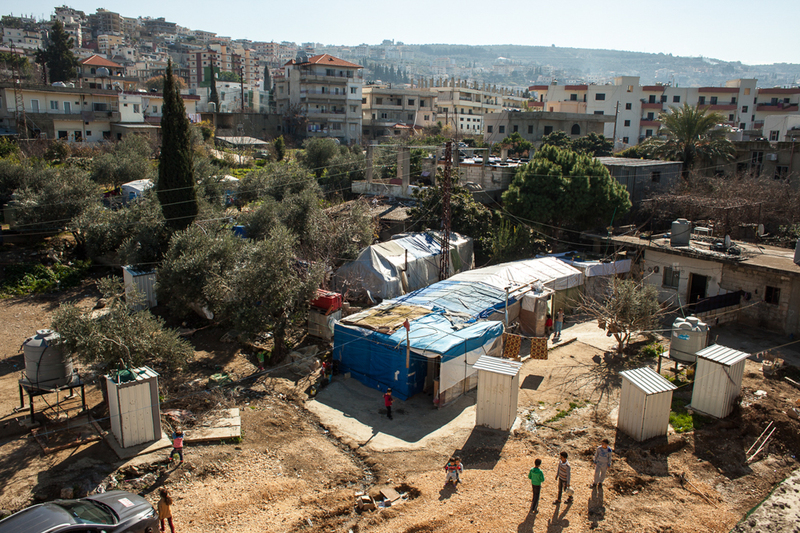 Some Lebanese landholders have opened land for informal settlements for refugees from Syria on the fringes of their agricultural fields, charging on average USD$200 a month for a small plot of land. 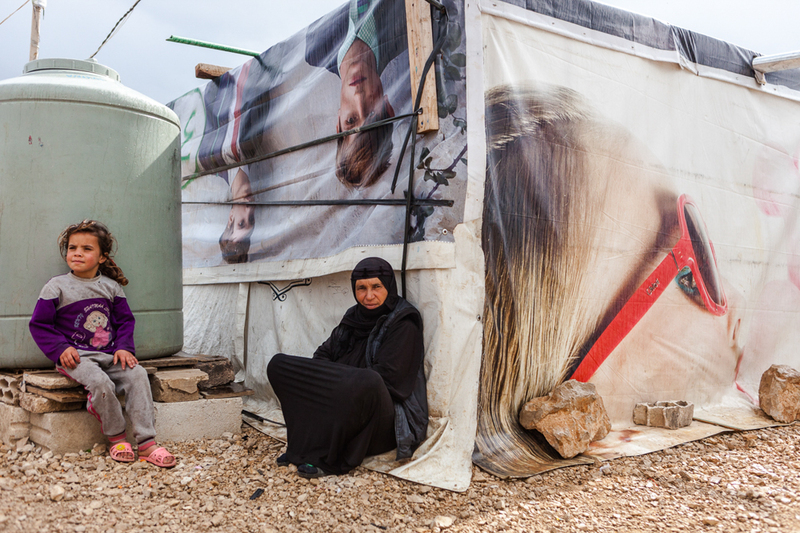 With the competition for land, evictions are common, adding to the fragility many Syrians feel in Lebanon. Historically many Syrians travelled to Lebanon to work during peak agricultural seasons, in particular during the olive harvest in autumn. According to United Nations Food and Agriculture Organization, the conflict in Syria has caused production costs for many Lebanese farmers long accustomed to using cheaper, subsidized, Syrian agricultural additives to increase crop yields. However, with the traditional flow of cheap Syrian food products decreasing, FAO report that many Lebanese farmers have started charging more for their products in the domestic market. Young mothers with their children catch the last of the fading daylight hours before returning to their tents for the night in the Informal Tent settlement, Helba, Lebanon. The Danish Refugee Council (DRC) is a humanitarian, non-governmental, non-profit organisation founded in 1956 that works in more than 39 countries throughout the world. DRC fulfils its mandate by providing direct assistance to conflict-affected populations- refugees, internally displaced people (IDPs) and host communities in the conflict areas of the world and by advocating on their behalf internationally and in Denmark. DRCs vision for the regional programme in the Middle East and North Africa reflects the global vision to work towards the protection and promotion of durable solutions to refugee and displacement problems, on the basis of humanitarian principles and human rights. The overall goal of DRCs strategy for the Middle East and North Africa is: to support and strengthen a regional protection framework for displacement-affected communities throughout the Middle East and North Africa. Since 2004, the Danish Refugee Council has been one of the largest International humanitarian NGOs operating in Lebanon with a focus in 2015 on the provision of emergency assistance to displaced Syrians, and supporting the capacities of hosting communities across the country. Despite increasing difficulties registering as a refugee in Lebanon since the government’s revocation of registration rights of refugees from UNHCR to the Ministry of Social Affairs (MoSA) as of January 2015, Lebanon continues to host the largest number of refugees in the world per capita - with one in four of its population reported as a refugee. As of 31 December 2015, the total number of registered refugees from Syria in Lebanon stood at 1.2 million, with Bekaa Valley hosting 371,809, Beirut 311,098, North Lebanon 260,932 and South Lebanon 125, 272. As the Syrian refugee crises moves into its fifth year, transitioning from an emergency to a protracted situation, DRC Lebanon continued to refocus programming towards transitional and durable solutions.